Create With Me: Merry Monday - Is it still Christmas? Well, not really - Epiphany has come and gone - the Wisemen have returned to their own countries - and we move into dark winter - but the Merry Monday Challenges happen every Monday and they keep me on track for having all my cards ready before next December! The challenge this week is white on white with neutrals. I used Classic Kraft ink for the sentiment. 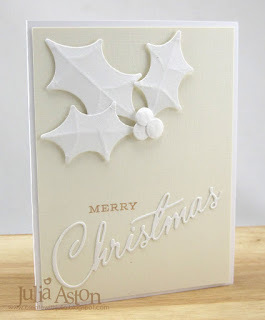 I used linen cardstock in both Fresh Snow and Vintage Cream. When I die cut the pieces out of the Fresh Snow Linen Cardstock for my first card - it left an interesting negative panel which inspired me to make this next card. I die cut the holly, berries and sentiment in a carefully placed layout out of the white linen and layered it over a piece Gold Foil Cardstock from DCWV using lots of foam dots to keep the panel up off the gold. There's just one more day for this week's Make it Monday challenge - but there will be another one on Monday! 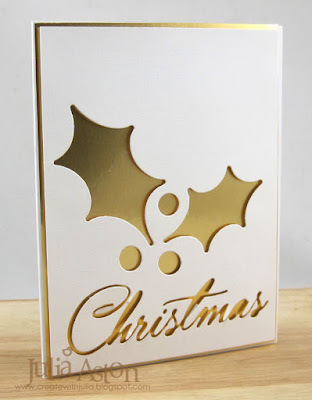 Paper: White, Linen Cardstock Fresh Snow and Vintage Cream - PTI, Gold Foiled Cardstock - Die Cuts with a View Cardstock Stack. 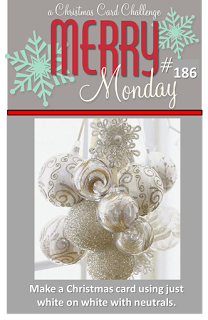 Accessories: Dies - Spruce and Sprigs, Christmas Cheer - PTI, foam dots. Stunning - those '3D' leaves and berries are just gorgeous! Sooo smart for scoring lines into your holly leaves! Love this!! Both cards are fantastic. I love that you scored the leaves for dimension and the gold panel behind the cut outs just shines. Two beautiful cards. Thanks for joining us this week at Merry Monday. Yes ma'am, it is still Christmas! At least in my house it is, all that is left though is the tree and it will be boxed up today and put back out in the garage until next time. 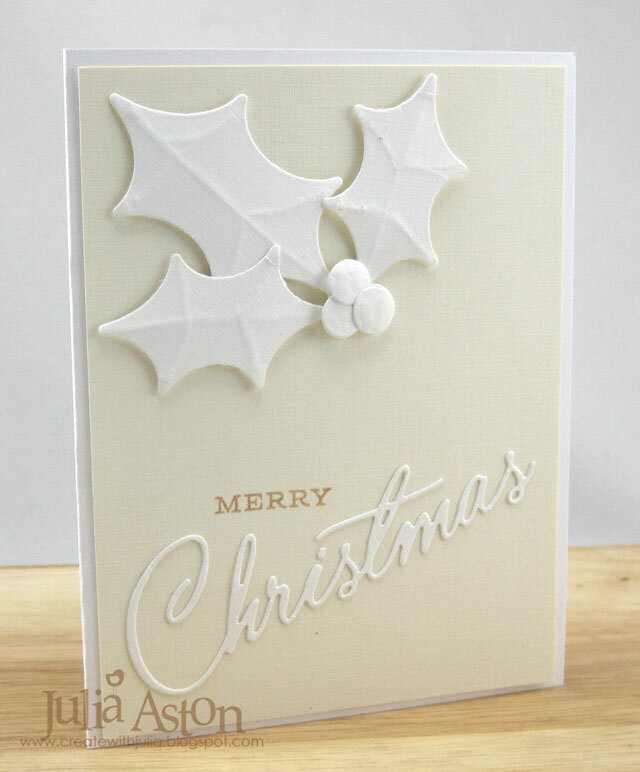 Simply fabulous cards...love all that gorgeous white. 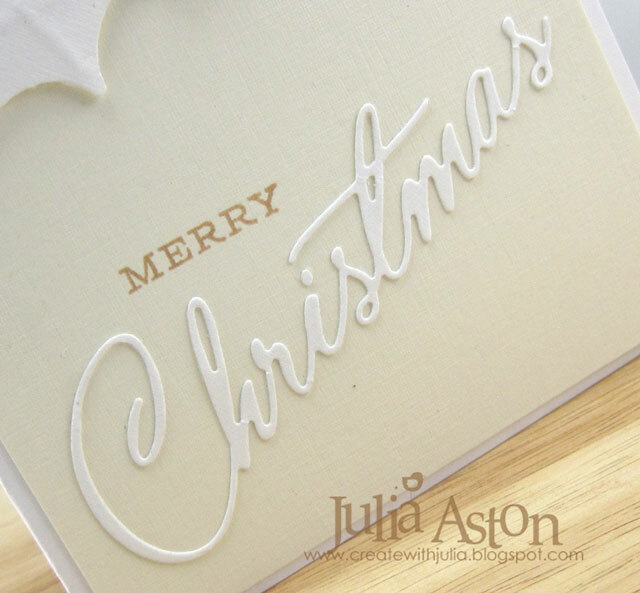 Both cards are stunning Julia, Thank you for playing along with Merry Monday. 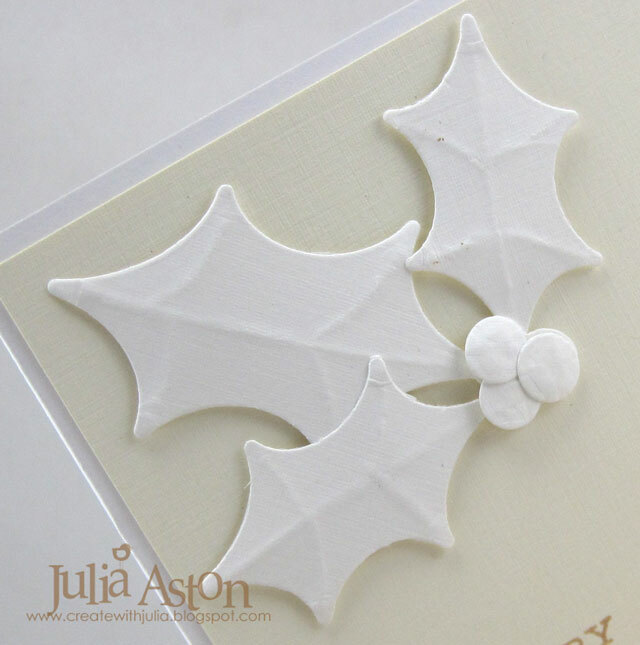 This gorgeous white holly jumped out of the Merry Monday gallery at me, Julia! And I love how you used the negative too! Well done! Thanks for sharing it with us at Merry Monday! I like the cram and white combo - lovely. Gorgeous and elegant Julia! So very pretty! Love these elegant cards Julia--white on white and white and foil? Lovely! These are beautiful!! Well I don't think its Christmas, but a great idea to start cards for next year!!! Both are so beautiful and different even with the same supplies! Love the extra score detailing you added to the holly leaves. Must try that. Wonderful Christmas cards.